Malaysian Christians this week have been anxious about their right to practise their faith without state interference or provocation from militant Islam, as three cases concerning religious freedom have come to court. Much is riding on the legal system to affirm Malaysia’s constitutional guarantee of religious freedom. Christians in Malaysia have endured steady attacks on their faith during the past year. There have been taunts, such as a banner declaring “Jesus is the son of Allah” attached to railings of a church in the popular resort island of Penang. There have been threats, including petrol bombs hurled at a church, and the seizure of bibles. And there has been the hounding of Rev. Lawrence Andrew, the editor of a Catholic newspaper, who insisted his paper will continue to use the word “Allah” to name God when appropriate, despite his effigy being burnt, protests outside his church, and a charge of sedition being laid against him. The government’s order allowing only Muslims to use the word “Allah” is particularly galling to Christians in multiracial Malaysia, a nation once tolerant of all creeds. The indigenous Sabah and Sarawak, who constitute 70 per cent of the country’s Christian population, have been using the word in their theological vocabulary — both in worship in the Malay language, or in written form in the Malay Bible, the Alkitab — for more than 100 years. Yet the government, individual Sultans and state-sponsored Muslim bodies dictate that ‘Allah’ belongs exclusively to Muslim Malays, despite widespread criticism of the policy from Muslim scholars around the world. The controversy, which began in 2006 when the government banned the Herald from using the word, has led to acts of provocation against Christians and undermined religious harmony. The Catholic Church contested the order and the High Court restored the newspaper’s constitutional right to use the word in 2009. The government appealed that decision and in October 2013 a three-man Court of Appeal ruled that Malay Muslims had an exclusive claim to the word “Allah,” a word that precedes the birth of Islam. On March 5, a seven-member bench of the Federal Court, after hearing points of law raised by the Herald’s lawyers, reserved judgment on whether to grant leave for the case to proceed. The lawyers raised a number of questions, covering ministerial powers and constitutional issues such as freedom of speech and religion. They also challenged the Court of Appeal’s power to decide that the word “Allah” is not integral to the Christian faith and practice. The state, in asking the court to reject the church’s petition, claimed that Christian usage of the word would endanger national security because it would confuse Muslim Malays, though the Herald had been using the word in its publications for 14 years before it was barred from doing so in 2006. During that period, no problems or incidents came to light regarding public order or safety. Jason Abbott, director of the Center for Asian Democracy at the University of Louisville in the United States, argued March 4 on his university blog that the “Allah” issue is being stoked by Malaysia’s ruling party, the United Malays National Organization, which has been losing support from the country’s sizeable Chinese and Indian voting blocs, to shore up support among ethnic Malays. The UMNO faces a challenge in two weeks from the opposition in a by-election in Selangor state. “A firm decision one way or another on the issue today could have had negative consequences for UMNO in those elections so I don’t think we should find this procrastination surprising given that most independent analysts do not consider the judiciary in Malaysia to be an impartial arbiter,” Abbott wrote. The church’s lawyers welcomed the decision to appoint a panel of seven judges, comprising the judiciary’s most senior officials and including the chief judge of Sabah and Sarawak, to deliberate on the application. This is the first time such a large bench has been constituted to hear a civil case. Prior to the court sitting, the president of the Malaysian Bar Council, Christopher Leong, reiterated a message from Prime Minister Najib Abdul Razak to not heed extremist elements in Malaysia bent on destroying trust between races. “There should be no place for bullies, bigots and racists,” Leon said. “The issue of ethnic and religious tension is far too serious a matter for games of political one-upmanship”. He urged all Malaysians to follow the Prime Minister’s call to work together for a cohesive and united Malaysia. 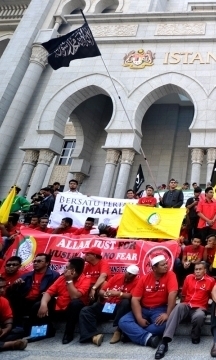 The appeals for calm and reason were lost on Muslim extremists who demonstrated against the Herald’s appeal outside the court in the Palace of Justice in the administrative capital of Putrajaya. The crowd, shouting and screaming, tried to breach a police barrier and force entry into the court building. The Herald’s case was one of three before Malaysian courts this week. On March 4, a High Court was scheduled to decide whether to grant leave to the Borneo Evangelical Church in Sabah to proceed with its application for a judicial review. The hearing was postponed because the judge went on medical leave. “It is more than just a word. It is about the fundamental right to worship God in the way we have been doing for generations without hindrance,” church President Rev. Jerry Dusing said. Another case before the High Court during the week concerned the confiscation of compact discs which had the word “Allah” in the title. The CDs were brought into the country by Jill Ireland, a Christian from Sarawak, in May 2008. She filed for a judicial review of the seizure in August 2008, seeking a declaration that she has the right to use the word. The High Court granted her request, and a date for case management was set for March 6. All three cases revolve around the use of “Allah” in published material, as in the Alkitab and the Herald, or in worship in the Malay language; in Sunday school literature; and in personal use of religious audio recordings. The National Evangelical Christian Fellowship said diminishing any of these freedoms would undermine the constitutional rights of Christians. Its call for prayer and contemplation contrasted to attempts to raise tensions before Wednesday’s Herald hearing. Postings on the internet purported to show Muslims who had “converted to Christianity” sitting in what look like church pews. A blogger claimed that the picture was taken in a church where Muslims were baptized. False reports also were circulated that three people had been arrested in Penang for distributing bibles to Muslims, a claim denied by the authorities. The rise of Islamic extremism in Malaysia was the subject of Time magazine essay this week, which reported that Prime Minister Najib, who came to power in 2009 as a moderate, had back-tracked on his “One Nation” policies to mollify conservatives within his ruling United Malays National Organisation party. Time‘s Asia editor, ahead of U.S. President Barack Obama’s planned visit to Malaysia this April, wondered whether a country with a history of racial and religious harmony “can or cannot reconcile Islam with a contemporary age.” Saudi-style Islam, he wrote, is not widely accepted in Southeast Asia, which has largely practised a more tolerant form of the faith. The move toward strict Islamism also is evident in the nearby oil-rich country of Brunei, where the sultan has imposed Sharia, or Islamic law, permitting cutting off the limbs of thieves, stoning accused adulterers to death, and flogging homosexuals and those who drink alcohol.